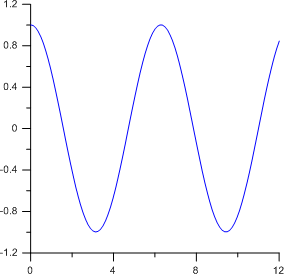 Create your graph, as normal. In this example, I've created a function plot using the Home | New Graph | Basic | Y=f(X) Function Plot. 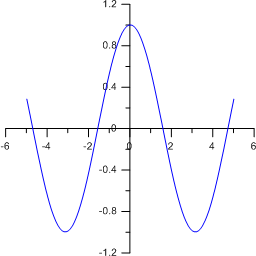 The default cosine curve is displayed. The graph is displayed with the default axis locations. Click on the Function Plot 1 layer to select it. In the Property Manager, click the Data Limits tab. Change the First value to -5. Change the Last value to 5. The axis automatically updates to show all the data. Now, let's move the X axis so that it crosses the Y axis at the zero value. Click on X Axis 1 to select it. Next to the Position option, click the Set button. In the dialog, select At data value of... and make sure the value is 0.0. 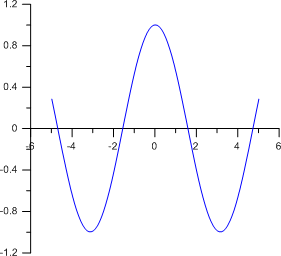 The X axis now crosses the Y axis at Y=0. Move the Y axis so that it crosses the X axis at the zero value. Click on the Y Axis 1 to select it. In the dialog, select At data value of... and make sure the value is 0.0. Change the Move option so that X Only is selected. This will move the Y axis to the right, but not up/down. 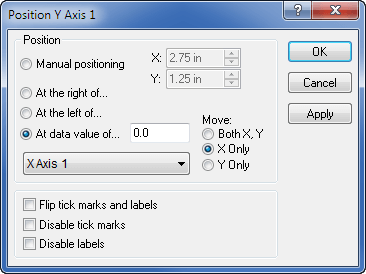 Set the position to At data value of... and select to Move in the X Only direction. The axes now cross each other at the zero values. Once both axes are moved, the axes cross each other at the X=0 and Y=0 locations. If the axis limits change, the axes will need to be reset to these locations again, but following the steps above again.